My bullet journal is divided into two sections: the first half is my weekly diary, and the second half is made up of my collections. 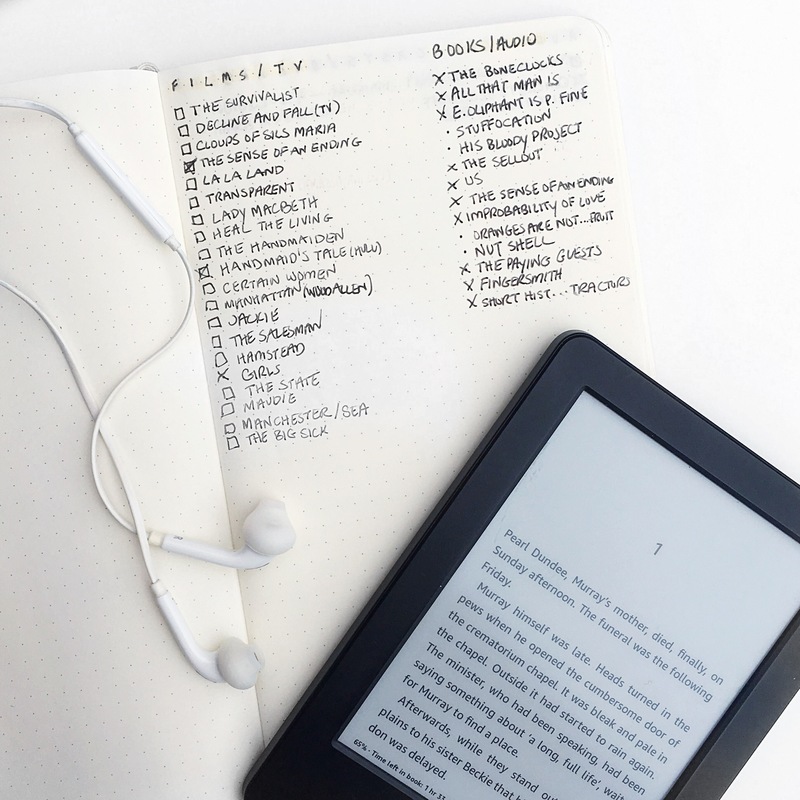 My collections are pages dedicated to all kinds of things – emergency contacts, travel itineraries, holiday ideas, blog schedules, songs to learn (read more about my collections here), and also a few “master” lists. 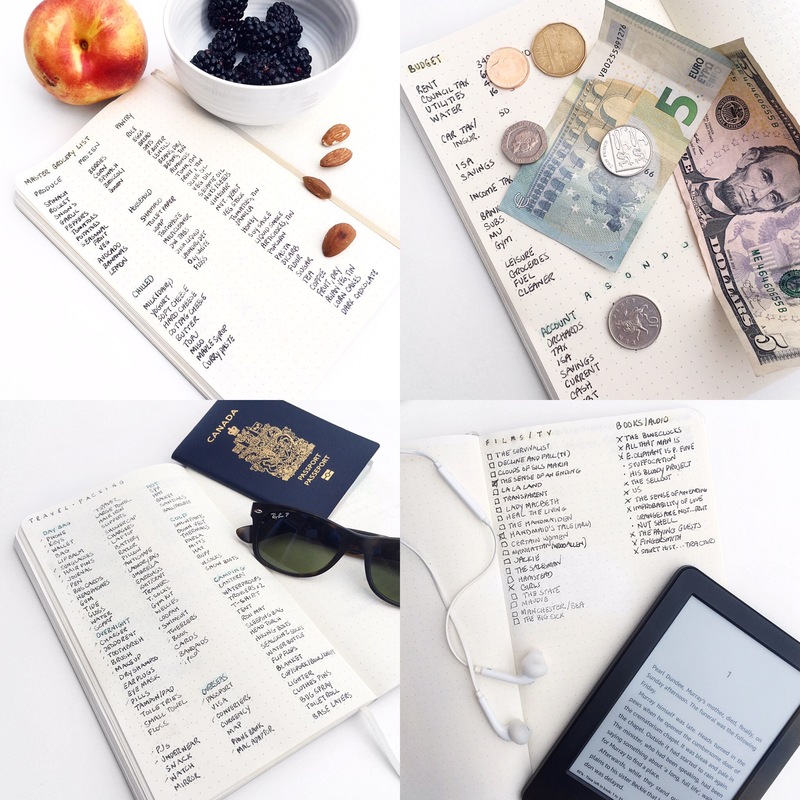 Here are a few of my favourite checklists that help to keep me on track! 1. 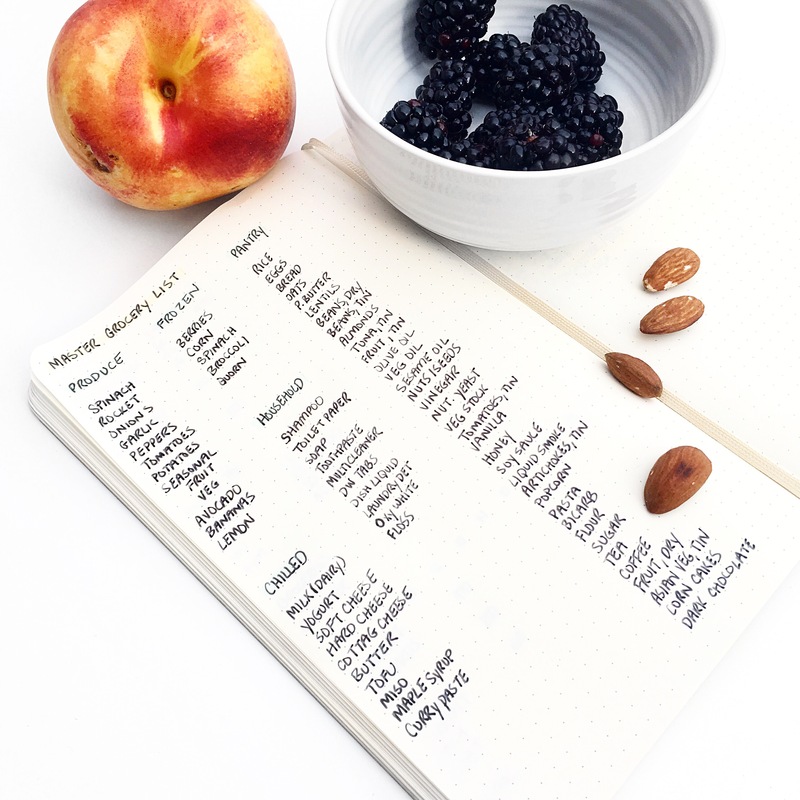 Master Grocery List. This is my “essentials” food/home list that I reference before I go grocery shopping. I have a quick look through the list, make sure I’m stocked, and add anything I need to the shop section of my weekly landing page. These are all things I like to have on-hand at all times. It doesn’t include specific vegetables, fruit, proteins, etc. because I try to buy whatever’s in season fresh for recipes as I need them. My master list contains staples that support these seasonal ingredients (though I can also make lots of meals with these alone, too). I categorize items according to where I keep them, not where they’re bought (ie. maple syrup lives in my fridge), so I can glance quickly around my kitchen to see whether I need to replace something. 2. Films/TV/Books/Audio. When I read a review, watch a trailer, or hear about something I’d like to watch/see/hear, I write it down immediately. It’s so simple, but so useful. Before I started doing this, I was always at a loss for what to download/borrow. Now when we sit down to watch a film, I don’t have to spend 20 minutes scrolling through Rotten Tomatoes beforehand. I also listen to a lot of radio review programs (Open Book, A Good Read, Front Row) and am now more likely to follow-up after hearing the interviews. I pull my journal out in the cinema, in restaurants, mid-conversation, and get it down as quick as possible so I can indulge later. 3. 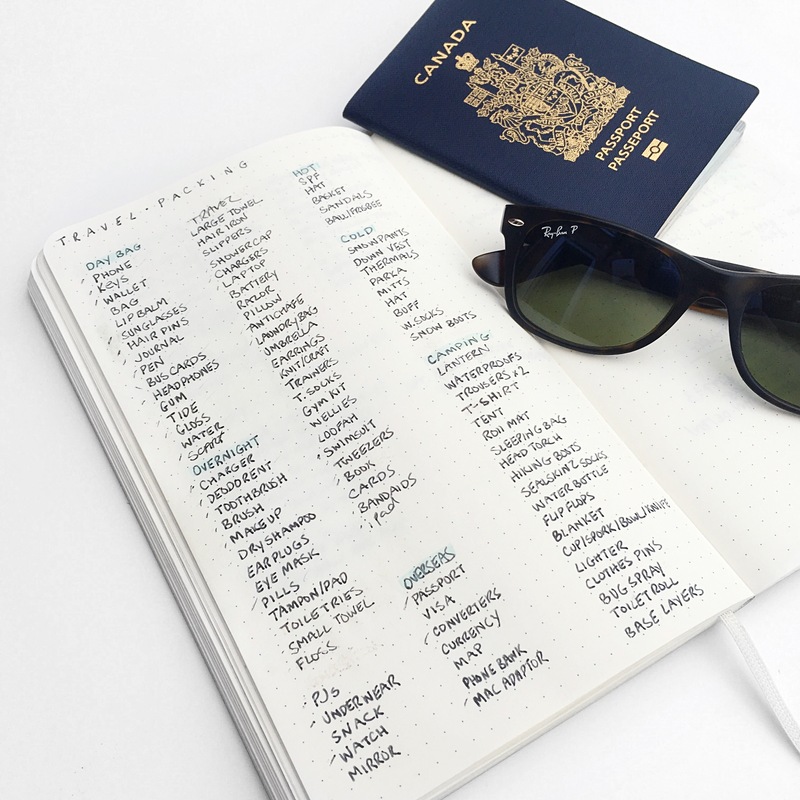 Ultimate Travel List. I wrote a full article on this list earlier in the summer, because I use it all the time. Over the last 6 months I’ve checked and erased this one so many times that the paper should be transparent by now. Whether I’m nipping to London for the weekend, or spending a month at home in Canada, this is my point of reference. 4. Monthly Budget. 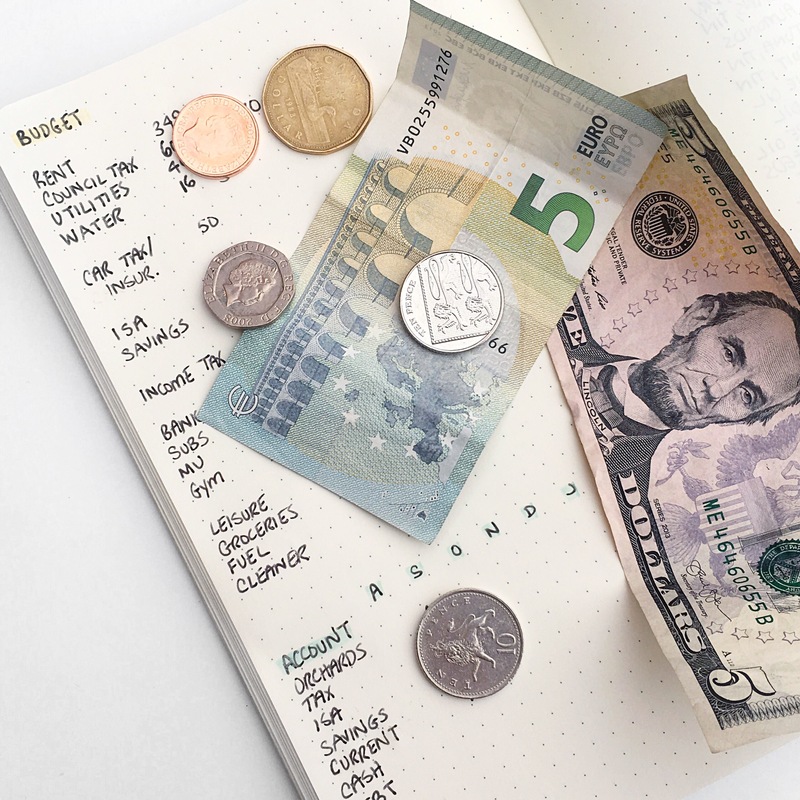 I used to keep my personal budget in an excel spreadsheet, but I’ve found it easier and more satisfying to document my income and expenses here. I thought I’d never really use this, but I love the feeling of physically ticking off bills once I’ve paid them. It works. I list expenses down the left side, and months across the top. Previous the 10k step goal | are fitness trackers more harm than good? Can you show or send a link to the actual journal that you use? Do you always keep it in your handbag to refer to when you’re shopping, etc? I love your sections and would like to do the same thing — especially with groceries and movies. I do keep it with me at all times, so fortunately it’s very light. I keep very little in my handbag/backpack because I suffer from chronic shoulder/neck pain, so it’s one of only a couple things I carry with me. I’ve found having the journal and pen on me at all times to be really handy, and I can jot down ideas, to dos, shopping, etc as soon as they come to mind.